Now that your New Year’s resolutions have probably migrated to the “wishful thinking” portion of your brain, it might not be a bad time to set some realistic goals—the kind you can achieve, especially with the helpful prompts (and nagging) of Pocket Coach. This sweet and simple app from Apollo Innovations basically asks three questions: 1) What do you want to accomplish? 2) When do you want to accomplish it by? and 3) What do you need to do along the way to get the job done? 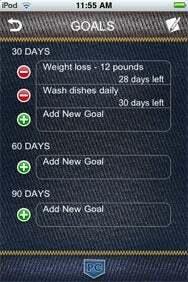 Goal Posts: With Pocket Coach, you can set goals that you want to accomplish in 30, 60, or 90 days. The goals are yours, but unfortunately, you’re restricted to these three time periods in which to accomplish them. After you’ve written down your goals—which you can choose to finish in preset 30-, 60-, or 90-day periods — Pocket Coach does much its work by simply reminding you, twice daily (at times you select), that you must set aside time to reflect upon what you want. You do this by thinking positively (using your own affirmations), reading positively (reading materials that generally fall into the self-help genre are suggested, but not provided), and through visualization exercises. You can create “stepping stones,” or actual actions you must take, on a small calendar provided within the Pocket Coach. Pocket Coach could help users by providing a few extras—for example, a few starter inspirational readings, or a list of affirmations. Overall its straightforward, no-nonsense approach to personal growth and achievements, along with the just-frequent-enough reminders that you need to get on the stick, are attractive attributes for an app that wants to help you get things done—not with one big knockout punch, but with a series of consistent, well-executed jabs.